WEST LOS ANGELES, CA--(Marketwire - October 26, 2009) - Nearly 800 music lovers and supporters of troubled children turned out for Vista Del Mar Child and Family Service's first annual jazz festival. The Oct. 18 fundraiser for Vista Del Mar -- one of the nation's most comprehensive care facilities for youngsters experiencing mental health, behavioral, emotional, or social problems -- was held at Vista's West Los Angeles campus and was headlined by Grammy-nominated percussionist and singer Sheila E. and co-chaired by Sheila, Lynn Mabry, Janis Black and Douglas Warner. Sheila E., whose foundation Elevate Hope has made substantial contributions to Vista's Arts Enrichment Program, was joined by members of the legendary E. Family, including her father -- Latin jazz great Pete Escovedo. The event, which was emceed by 94.7 The Wave on-air personality Pat Prescott, also featured: multi-Grammy nominated recording artist and musical director Patrice Rushen; Grammy-nominated saxophonist Dave Koz; acclaimed singer and actor TC Carson; jazz-funk drummer Leon (Ndugu) Chancler; actress and singer Sylvia Brooks; and award-winning violinist Karen Briggs. Also on hand for the afternoon event were KTTV Fox 11 and KCOP My13 News Anchor Christine Devine and accomplished actress, screenwriter, and director Nia Vardalos. Proceeds from the fundraiser, which was made possible in part by primary event sponsor 94.7 The Wave, will help support Vista's many therapeutic programs, including its innovative Arts Enrichment Program. At a time when many schools are drastically decreasing arts funding, Vista Del Mar -- through its special-education facility Vista School -- has expanded its Arts Enrichment Program that has helped hundreds of troubled youngsters heal through dance, drama, drumming, music production, singing, and songwriting. Other event sponsors included Beverly Hills real estate company Black Equities, Wells Fargo Bank and juice-maker POM. "On behalf of all the children and families that we serve, I offer my deepest gratitude to everyone who made this event such a success," said Elias Lefferman, Ph.D., president and chief executive officer of Vista Del Mar. "Special thanks go to Sheila E. who has been incredibly supportive of our Arts Enrichment Program, as well as to our event sponsors, and to the members of the community who spent their Sunday with us." Vista Del Mar Child and Family Services was established in 1908 and, over the course of more than a century, has evolved from an orphanage to a union of five specialized agencies working together to provide comprehensive, therapeutic, as well as educational programs and services for children and their families on a picturesque, 18-acre campus in West Los Angeles. These agencies include: Vista Del Mar; Julia Ann Singer Center; Reiss Davis Child Study Center; HomeSAFE (located in Hollywood); and Family Service of Santa Monica (located in Santa Monica). Between the nonprofit's residential, outpatient, community-based, and education services, Vista Del Mar provides 45 programs to nearly 6,000 children and families annually. Services provided by the agency include, but are not limited to: therapeutic, residential treatment for severely emotionally disturbed youth; private adoption services for both domestic and international adoptions; community-based foster-care; a network of mental health and case management services for children at risk of out-of-home placement; a private, special needs school (K-12); mental health services to students in schools throughout Los Angeles; therapeutic services for children with autism; individual and group counseling for children and families; educational assessments and treatment; child abuse prevention services; and early childhood care and provider training. For additional information, visit www.vistadelmar.org. 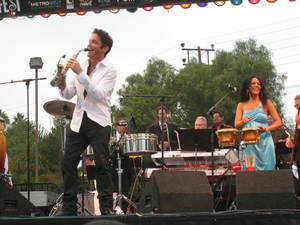 Nearly 800 music lovers and supporters of troubled children turned out for Vista Del Mar Child and Family Service's first annual jazz festival.